" I S T H I S B Y D E S I G N O R R A N D O M F A T E ? " But who does? When faced with the uncertainty of certain farces, we cower behind humour and sarcasm. I keep my head forward, back straight and feet planted to the concrete. Dressed in black to suit the forsaken. Large rims hiding tired eyes, and lips parted to breathe. Wandering around the streets, alone in the crowd. I am lost. Not often, but enough to question. What kind of person I am, unaware of my own strengths and weaknesses. Questions I wonder as I stare at blank, brick walls. As if I stare long enough, they would form a cohesive answer. Answers I’m sure will still leave me unsatisfied. As most answers do. Perhaps that is why we look for answers through other means. Instead of staring at blank walls, some find solace in bars or prayers. Hands clasped together or holding a half-empty glass. Different answers for different people with different needs. Each answer unique, but all equal. I am only certain of one answer. I know for certain it is faith in myself I lack. An overwhelmed hubris and damaged confidence is to blame. Growing up completely sure of a certainty I'm now questioning. When I sit alone and walk alone and remain alone. I wonder why when I don't know. But then I guess, I shouldn't know. All these things I can't explain. How I came to be where I am today. Why I am here this moment. When will I disappear? Asking the same questions left unsolved. Words spitting out but still cluttered, tied together by bare syllables. I don't have anymore answers. Though perhaps it's best if I don't have them. We fear the unknown and we want to know. It would be wonderful to know but what a waste it would be. It is tragedy to have all the answers and have nothing left for yourself. Maybe I don't know, and I really don't care. Jon Bellion’s Maybe IDK is a masterpiece in itself. His simple words joined by a good beat helps me forget. His melody swaying in my mind. It is the pivotal inspiration to this uninspiring outfit. In which I hang in sweats for comfort and my favourite heels to imply some sense of sophistication. Perhaps my favourite outfit because its easy wear for school. Both to cope with the wavering weather, and to reflect how Law School makes me feel. Like a dull fog hovering over. 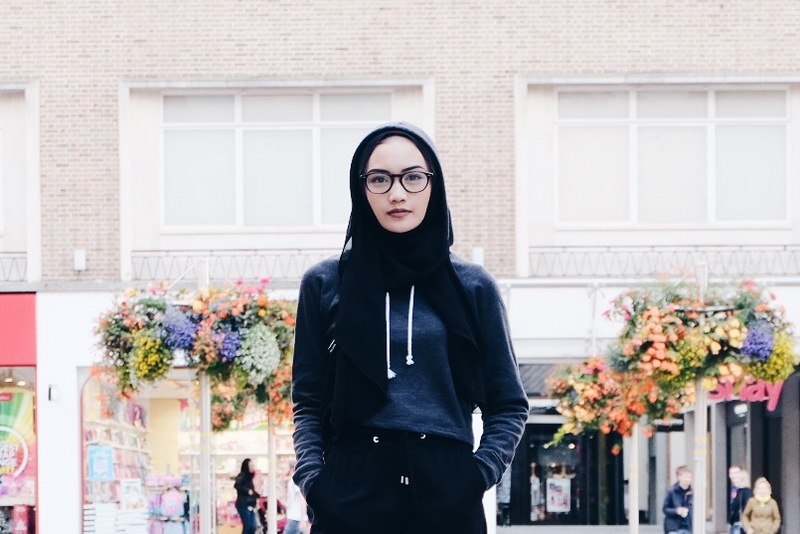 To embrace it, I paired my Dark Grey H&M Cropped Hoodie with Black Bershka Joggers to ease my day. Since heels are the common enemy to Exeter's hills, I wore my Black Summit Heels to worsen my day. Because happiness is hopeless in University. How do you embrace feeling lost?